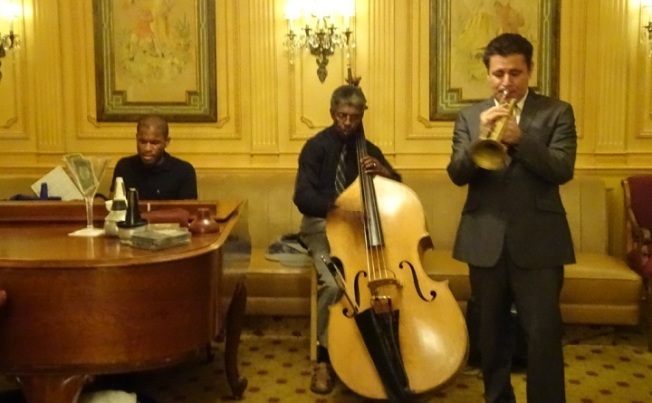 Joshua White, Marshall Hawkins and Gilbert Castellanos perform most Friday nights at Westgate Hotel's Plaza Bar. Almost every Friday night (barring an occasional substitution), trumpet master Gilbert Castellanos holds court at the tiny Plaza Bar at the Westgate Hotel in downtown San Diego, leading a revolving trio that explores the jazz tradition's most salient tenets. Surprise is one of those key tenets. Saxophone icon Wayne Shorter famously opined, “To me, jazz means I dare you.” All through Friday night, Castellanos, with pianist Joshua White and bass legend Marshall Hawkins, cradled surprise like loving fathers. The trumpet man began “It Could Happen To You,” with tentative pulsing, making his case with a golden tone in languid tempo, frequently pausing in the middle of a phrase to gently squeeze a single note -- building the excitement incrementally. White took up the cause with powerful melodic sequences, classical flourishes and streams of gorgeously realized thematic logic. An oddly grooving cowboy rhythm dominated “On the Trail,” beginning as a duet between Castellanos and the redoubtable Hawkins, each man knitting strands of melody more complex and organic than the one that came before. Once White asserted himself, Hawkins and Castellanos just stood back and marvelled at the directions to which the pianist committed. Then it came down to Hawkins alone, who began with the musical equivalent of whispering -- causing everyone to lean forward. Hawkins’ improvising aesthetic is sui generis, nothing seems the result of licks or preplanned patterns. Like White, you can hear him singing along with the lines he creates in the moment. Swing isn’t just an idea with these cats; it’s more like an inherent practice that cannot be subsumed, so when they locked into “Taking A Chance on Love,” the lack of drums seemed completely incidental, because the sense of shared pulse was unshakable. White hit the gates running, combining joyous single lines toggled against dense block chords, while Hawkins provided maximum groove with minimal wasted motion and Castellanos provided a master class in repetition as a tension-creating device -- literally “worrying” one phrase into a tizzy before launching into the next. Speaking of the masterclass idea -- if you haven’t seen Mr. Castellanos deliver his ever evolving dissertation on the creative use of the common plunger mute -- fix that now! After hastily deciding on which tune to play (“Five Spot Blues” was the winner after a conference around the piano where White sang the melody), Castellanos lit up the night with burbles, growls and piercing jabs. White went for the blank canvas idea, creating an on-the-spot blues etude that developed into a full-blown novel that blended baroque ideas with more visceral logistics. Suddenly, the group as a whole transformed into a beautiful synapsis of the late Daniel Jackson’s “Wisdom,” with a hushed reverie that permeated the room. Hawkins began his feature, “I Should Care,” alone, using his bow and the sound of his voice in tandem to layer a dark, regal sonority that White caressed with pensive harmonies. Hawkins' solo once again seemed to be operating as a tachyon transmission -- there didn’t seem to be any latency between thought and reality. An aggressive, angular romp on Monk’s “Rhythm-A-Ning” closed out the set, with White carrying most of the load, rocketing through pointillistic refraction to ragtime and barrel-chested swing, constructing and deconstructing each element along the way. This is the way it’s supposed to sound.